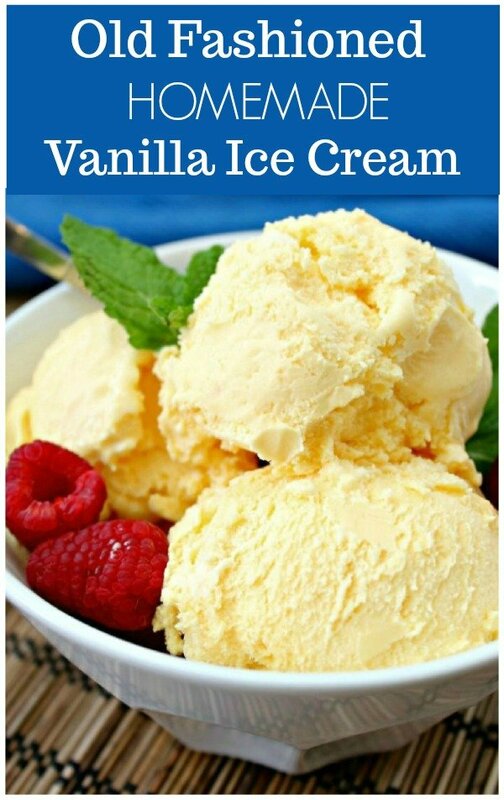 Only 5 ingredients for this Old Fashioned Homemade Vanilla Ice Cream. It's so easy to make homemade ice cream! Old Fashioned Homemade Vanilla Ice Cream is a dessert you can enjoy all year round. This is one of the easiest ice cream recipes you can make that is no fail. Throw it in the ice cream maker, and then sit back and wait for your delicious ice cream. We have a lot of homemade ice cream recipes on our site. One of our favorite ice cream recipes is Raspberry Brownie Chunk Ice Cream. Every summer my Mom pulls out her ice cream machine and makes homemade ice cream. It’s our family’s 4th of July tradition! We always add candy or fruit to the ice cream – one of the best flavors is when she mixes it with Reese’s Peanut Butter Cups. Great news, you do not need to have an ice cream machine to make your own homemade ice cream. You can easily adapt the recipe, or find so many recipes on the internet that are for no-churn ice cream. We have a No Churn Birthday Cake Ice Cream recipe that is delicious. A lot of recipes that don’t require an ice cream maker may have some mixing involved with a hand mixer. It’s usually partway through the freezing time. It’s so easy and every time you beat it the ice cream becomes creamier. Don’t worry about beating the ice cream too much with the hand mixer. It will only make it more smooth and creamy. Be sure to use a good quality vanilla extract. That helps with creaminess and good vanilla flavor. If you do choose to use an ice cream maker/machine, they are really easy to use and very convenient. You can also buy smaller ones that are great for small families and couples. eggs or no eggs for creamy homemade ice cream? As we look through so many homemade ice cream recipes, many have eggs in them. You can have a delicious creamy ice cream with or without eggs. Just follow the recipe you are making if it comes from a dependable source. Ice cream experts probably have their own opinion. Some of our ice cream recipes use eggs, and some do not. Our recipes have been tried and tested, some with eggs and some without. The more eggs you add to your ice cream, the more of a yellow tint it will have. Every summer we would try a new flavor or fun add-ins for our homemade ice cream. We love to add fresh fruit in season (raspberries are our favorite), we would break up candy bars, and even make a batch of brownies and cut them into small chunks as an add-in. In a large bowl whisk together the heavy cream, whole milk, sugar, vanilla, and pinch of salt. Pour into the ice cream maker container. Turn on machine according to the manufacturers directions for the ice cream maker. After the ice cream is done churning, transfer to an airtight freezer container. Ice cream is good for up to 6 weeks in the freezer. Pour into the bowl of an ice cream machine. After the ice cream is made, transfer to an airtight container, cover tightly and freeze . 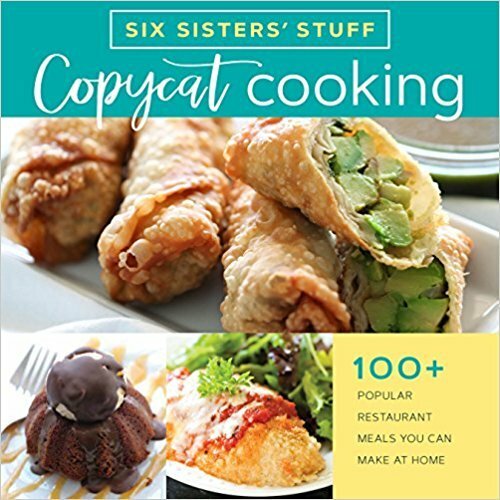 Be sure not to miss another recipe! Check out how to make Copycat Chili’s Molten Lava Cake to go with your homemade ice cream. Oooh! I'm pinning this. We just got an iceless ice cream machine from a friend. You don;t need rocksalt or fresh ice, you just keep the canister stored in your freezer. It works like a charm! I'll suprise my husband with this tonight with a peanut butter syrup and peanut butter cup crumble. Thanks for the inspiration! This looks yummy and simple, but how does it compare to batters made with egg yolks? And how did it get so yellow without them? We are always trying different kinds of Homemade ice cream recipes. Some with eggs and some without. We like them all! The vanilla adds some color to this vanilla ice cream. While this does taste ok, we felt it tasted more like cool whip than ice cream, and a pricey version at that. My husband wants it for his pumpkin pie on Thanksgiving so it won't go to waste but this did not come out as hoped or expected. How long doesn't it take to freeze? You will want to freeze it for about 2 hours. This was so easy and delicious! Thank you! Doesn't say how much it makes. It will serve about 4-6 people. It just depends on how big your servings are. Every tried this with chocolate milk? Why am I not seeing the amounts for the ingredients? I see the ingredients listed and the directions for mixing them all together, but no amounts for each ingredient. Hi Linda. I went out to check the recipe, and the ingredients are not listed. We will work on fixing this post. Here are the ingredient amounts - 2 cups heavy cream 2 cups whole milk 3/4 cup sugar 2 teaspoons vanilla Pinch salt Hopefully we'll have it up and running soon. Thanks for the heads up! I don't see direction without an icecream mechine? I tried this tonight, as written. NO luck! It never got thick or even a frozen consistency. I rechecked the ingredients and I made it as written.